Home 2017 motogp Valentino Rossi Valentino Rossi: "Many drivers want my place"
Valentino Rossi: "Many drivers want my place"
Will Valentino Rossi continue his career after 2018? The old master wants to make this question dependent on his results. He is aware, however, that younger drivers want to take their place. 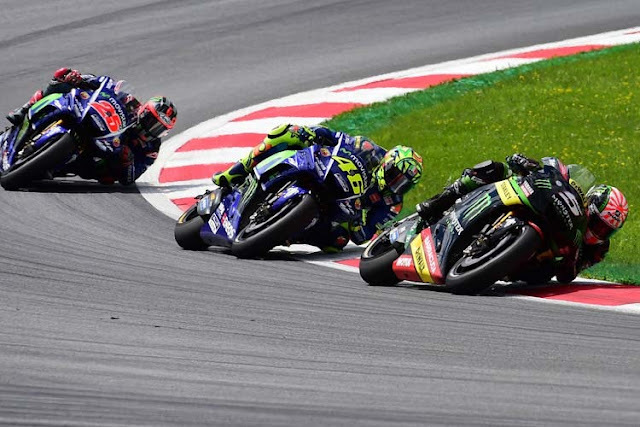 Nine titles, 115 victories, 226 podium places and 64 pole positions - Valentino Rossi is already one of the most successful motorcyclists of all time. Despite his 38 years, the Italian can well imagine extending his contract with Yamaha after the 2018 season. Rossi, however, is aware that young, fast drivers like Johann Zarco or Jonas Folger are already squinting at his place in the Yamaha factory. "Many drivers want to take my place and ride my motorbike. But it will not be easy for them, "Rossi laughed. "I will continue to get the maximum. Crucial is to be strong and competitive, otherwise you can stay at home, "Rossi said before his enduro accident on Thursday against" motogp.com ". Will Rossi continue his career after 2018? "I'll decide in the first half of the season. If I can fight for podium places and victories in the first six races, I would like to continue. But there is still a long time to go. In the MotoGP class you have to think day by day and race for races. It's too early to think about 2019. "